Varsity track and field swept the Monrovia Wildcats in its first league dual meet at home on Tuesday, March 28. The girls dominated with a score of 85-38 while the boys found victory by a large margin at 97-30. In previous years, Monrovia has been one of South Pas’ greatest competitors, though a smaller squad and the loss of several talented seniors limited the Wildcats’ hopes of defeating the Tigers. The boys’ distance runners took first in all of their events, led by junior Oliver Chang in the 800 meters and mile with times of 2:02.6 and 4:36.00. Senior Kieran Press-Reynolds, who took first in the two mile at 10:43.27, also placed second in the mile, helping the Tigers sweep the 1600 and 3200 meter races. The girls were not as successful in their events, ultimately unable to capture first in any of the long-distance events. However, they did take second and third. Freshman Emily Newhall captured second in the 800 meters at 2:33.03, while sophomores Elizabeth Bock and Lindsey Calva earned second in the mile and two mile, respectively. In the sprints, the girls dominated, winning first in every race. Sophomore Christina Taylor easily took the top spot in the 100 meters and 200 meters, though freshman Gianna Beasley was on her tail in the latter race. Beasley also placed first in the 400 meters, running a sub-sixty quarter at 59.11 seconds. No Wildcat runners ran in the 400, allowing the Tigers to sweep. South Pas commanded the boys’ 100 meter dash, led by junior Jack Renken, who was followed by senior Max Schoerner and freshman Tianhao Wei. Renken also garnered second in the 200 meters. While Monrovia dominated in the 400 meters, freshman Alex Reeves managed to give the Tigers points by placing third. South Pas prevailed the boys’ 110 meter hurdle and 300 meter hurdle races. 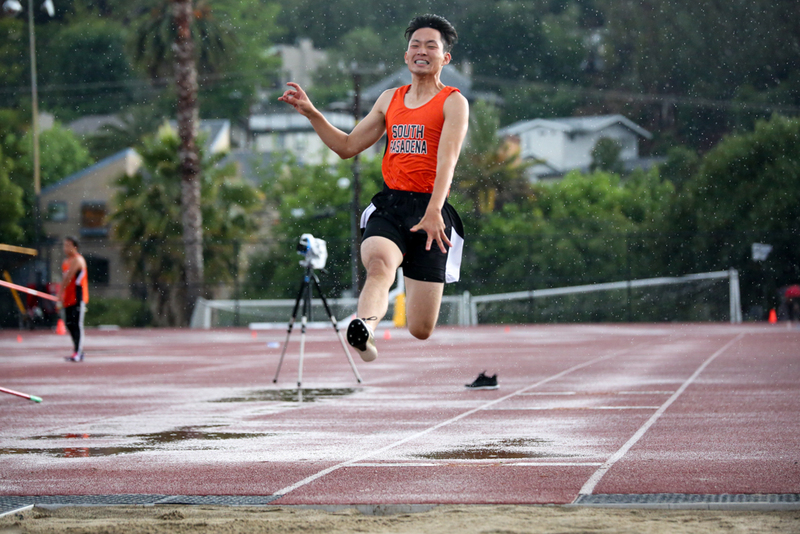 Junior Josh Ng won first in the 110 meter hurdles and third in the 300 meter hurdles, while Reeves and Wei took first and second in the latter. On the girls’ side, junior Cate Latting claimed second in the 100 meter hurdles. Latting led for a majority of the race, but her foot caught on a hurdle, causing her to fall. Undeterred, she picked herself up and managed to still take second. Sophomore Ashley Hugasian won the 300 meter hurdles by a wide margin with a time of 48.19 seconds. South Pas additionally performed well in field events. Latting and Ng took first in pole vault, and the boys also swept long jump. Schoerner, the leader in the long jump, also placed first in high jump. Junior Molly Round was the top jumper in the girls’ high jump. Hugasian and Wei also led in the triple jump for girls and boys. In shot put, junior Ben Martinez and senior Taylor Holmes triumphed with throws of 45.03.00 and 29.04.50 feet, respectively. Both boys’ and girls’ 4×400 meter relay teams ran unopposed, and the girls’ 4×100 meter relay team also won first. The boys’ 4×100 meter relay team, however, barely lost to the Wildcats by 0.01 seconds. Renken, the anchor, chased the Wildcat down until the two were neck and neck. Monrovia garnered the slight edge to win with a time of 44.80 seconds compared to South Pas’ 44.81. The Tigers’ next dual meet is at home against San Marino on Thursday, April 13. Tiger Newspaper gives one a unique chance to connect with peers throughout SPHS about student life and various activities. As Editor-in-Chief, Riley Segal supervises both the online and print production of Tiger and oversees staff management during her third year on staff.